Part way through this bowl of Jim's Evolving Work Blend in a 2003 Stanwell Golden Danish 56 Rusticated Canadian with a black vulcanite stem. HH Vintage syrian in a MM cob! Just stepped in from the company lounge, enjoyed a nice bowl of SP Black Cavendish in the Bent Brandy. Sippin Arnold Palmer & bergs. Peter Stokkebye Luxury Navy Flake in a Peter Heeschen bamboo shanked volcano. Finishing up a bowl of Uhle's 00 in a Country Gent. Paired nicely with a Crown Royal Vanilla on the rocks. Hearth & Home Chestnut in a Stanwell Royal Guard bent billiard. Just finished smoking Edgeworth Ready Rubbed Match in a 1984 medium bend black grain etched Savinelli Non Pareil 9310 poker with a horn ferrule and a black vulcanite stem. Rattray's Old Gowrie in a JL Thompson blasted author. English Chocolate in a Brebia Ninja squat tomato. About half way through this bowl of P&W #515 in a 1998 smooth straight Butz-Choquin Bistro 1501 pot with a black vulcanite stem. Revor Plug in a JZP Rhodesian. 2014 Peterson 3P in a 2015 Basil Meadows smooth slight bend tomato military mount with an aluminum accent, wooly mammoth horn ferrule, and cumberland p-lip stem. Sittin up in the mancave with the windows open, enjoyin the cool breeze and listening to the rain. Margate in the Bent Bulldog. Just finished smoking 2012 Rolando’s Own in a smooth straight Lane era “William Conrad” Charatan Executive Extra Large stretch apple with diagonal channel cuts on the lower right and left of the bowl along with a black vulcanite double comfort stem. Watch City Americano in a 1975 three quarter bend black Dunhill Shell 52021 with a black vulcanite stem. 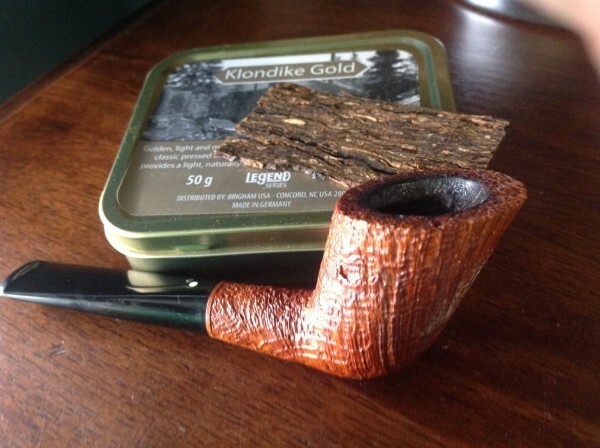 Dunhill flake in a straight falcon . 2004 McClellands Christmas Cheer in my Larocca Pisa P01. Three Nuns (Mac Baren Version) - just can't get enough of that weed! Starting off my smoking day with MacBaren Virginia Blend in a medium bend raw sienna toned early Radice sandblast egg with bamboo carving on the shank and a black acrylic stem. A bottle of Cheerwine is my drink. First ever bowl of Prince Albert from a pouch in a monstrous Tinderbox blasted bent. It's a sitter with a weird protuberance at the front of the bowl, for self defense? About to open my first tin of Samuel Gawith- Bothy Flake. Probably going to smoke it through a fresh MM. Peretti Oriental No.40 in a Ukrainian pear wood billiard. English Chocolate in a Brebbia Sabbatia Ninja squat tomato. GLP's Gaslight, in a small meer-lined Peterson lovat. 3P in a Ferndown billiard. Uhle's No. 300 in a Country Genr. Amphora Virginia in a smooth medium bend 2011 Rinaldo Collection Fiammata Silver Line 7 Odea 4 flame grain bulldog with a silver band and a tortoise shell acrylic stem. MacBaren Virginia Blend in a medium bend raw sienna toned early Radice sandblast egg with bamboo carving on the shank and a black acrylic stem. C&D Blockade Runner 2002 quarter bend sandblasted Stanwell Golden Danish 139 with a black vulcanite stem. Frederick Tranter Comfort of Bath in a 1976 black rough carved Pioneer Meerschaum Oom Paul with a brown acrylic stem. G&H Conniston Cut Plug in a 2013 bent MM Missouri Pride Legend with a yellow stem. G&H Brown Cavendish in a 1979 medium bend etch relief meerschaum lined TinderBox Arabesque with a black vulcanite stem. D&R Three Sails in a three quarter bend smooth 1985 Dunhill Chestnut 5202 with a cumberland stem. Paul Olsen Dark Flake MOB in a 1980 Stanwell 668 medium bend with a multi-colored ferrule, half black sandblasted, half brown smooth, rough top with a black vulcanite stem. Lane Andullo in a Ferndown bulldog. Escudo in a Ryan Alden bent Rhodesian. Just finished smoking D&R VIP in a 2004 smooth long shank Canadian Trever Talbot Ligne Bretagne Faite en Bretagne 4/3 with a black vulcanite stem. D&R Two Timer in a 1982 smooth straight Sasieni Ivory 105 Apple with a black vulcanite stem. TwoTimer in a MM Pride with a "P" lip upgrade vulcanite stem, first full bowl after touching off a couple of partial bowls from yesterday's endeavors. Gawith Hoggarth & Co. Rum Flake in my mini-meer lion head figural. 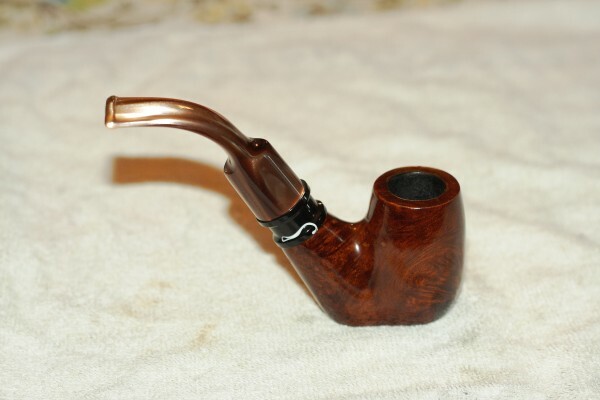 Just finished smoking 1970s Edgeworth Aromatic (Red) in a light brown 1979 rusticated medium bend Italian Sir Jeffrey Dublin sitter with a flared top and yellow stem. Have stuff to do early today. Part way through this bowl of Dorchester in a straight sandblasted pre-transition Barling Exel 249 Fossil T.V.F. black billiard with a silver band and a black ebonite military bit. A cup of Maxwell House, neat, is my drink.